When I pull up my WeatherBug® app these days, it shows a sun with cactus. It’s been a sun with cactus for days. It’s predicting a sun with cactus for another straight week. In case you’re a little slow on the uptake, that basically means it’s hot. It’s blazing hot. It’s some kind of near to hell hot. It’s so hot here in North Texas that my Facebook® feed has become a littered highway of automobile dashboard photos depicting 105°, 108°, 112°…you name it. When I walk from the house to the garage, I literally feel like I’m in the movie The Magnificent Seven, only no one is shooting at me. My dad always loved that movie, but as a kid I just remember thinking that all those people looked so hot. It was like the sun was glaring all the time, the landscape was a bunch of sticks and rocks, there were lots of men brandishing firearms and donning pants and vests and long sleeves, and everyone kept falling and rolling around in the dirt. Miserable. That’s pretty much how it is here. At some point, it honestly doesn’t really matter what the dashboard number says, you just don’t care anymore. It’s all the same swelter. You stand and sweat, along with everyone else standing and sweating, longing for the moment when someone posts a photo of the first Pumpkin Spice Latte. Ahhhh…fall. I have to admit that we have spent precious LITTLE time in the garden these past few weeks, and I have been seriously “momming.” This “momming” thing is not for the birds, people. I’ve been shuttling kids to movies, dropping off and picking up from camps, trekking around water parks, fixing seemingly endless meals and snacks…I was even assigned a part in a YouTube video this weekend by my son…all while still working for my clients and longing for the moment when someone posts a photo of the first day of SCHOOL!!! LOL. Can we get a “yes” here that, as of July 23, we’re all pretty much ready for this?!?!? When we WERE out, here and there, in the garden this last week, I honestly couldn’t help but marvel at some of my tried and true favorites still pushing on through, despite the perpetual sun with cactus. I surmised, though, that some of you might be blankly staring out a window, somewhere right about now, and disheartenedly wondering, “What the heck can I plant NEXT spring so that my July flower bed doesn’t look like a Mexican village taken over by the Calvera?” Have no fear. The Magnificent Seven are here. I snapped these photos Saturday when it was 109º at my house, and ALL of these beauties were bloomin’ hot (total pun intended)! I guarantee, with a little planning this coming spring, these can be surefire color-slinging saviors for your garden next summer. Here they are, riding into town to the rescue! Both of these specimens are in their second round of blooms right now, the first having been a spring bloom. If they can grow from seed on a Texas roadside, they can certainly grow in your garden! These are old-fashioned garden favorites! I LOVE, LOVE, LOVE Zinnias for their variety. From the tiny Thumbelina blooms to the giant doubles, they come in a palette of color in all shapes and sizes. I tend to love the giant doubles in pink, seen above. Your basic Orange Cosmos is also a winner, standing up to all kinds of heat with continued green foliage, AND attracting bees! The best part…all you have to do is scatter seed and watch them come up!!! If you need to “feel” like you’re gardening, then these two choices might be perfect for you. Autumn Sage is a super tolerant plant to grow and it comes in a variety of colors. It’s a medium-height clumping grower that will provide continuous color from spring until frost. I have it growing in red, pale pink and deep purple in my garden. You’ll need to have hand pruners in the spring to cut back all of the old, dead stems and help shape the plant as it begins to sprout. Want something bigger? Orange Zest Cestrum might be my most favorite shrub right now. We have this planted adjacent to our pond, and it provides lush, dark green foliage and continuous orange-yellow clustered blooms, again, from spring through frost. It attracts a multitude of interesting insects as well, but not really pests that harm the plant. In fact, it’s known for being relatively pest resistant. Once it begins to sprout in the spring, you will need a good set of loppers to trim off branches that you don’t want in order to begin to shape the shrub upward for the blooming season. This shrub gets big. Ours is easily between 5 to 6 feet tall right now and about 4 feet wide, so allow some space for this girl. This, ladies and gentleman, is the Yul Brynner of the Magnificent Seven. The leader, the champion, the one J. and I just said this week that, “We need a LOT more of.” If you want something big and showy to really add major pizzazz to your beds, I cannot recommend Phlox enough. Now, this is definitely an example of a plant that is easier to grow from cuttings or transplants, rather than seed, but that’s the best part! 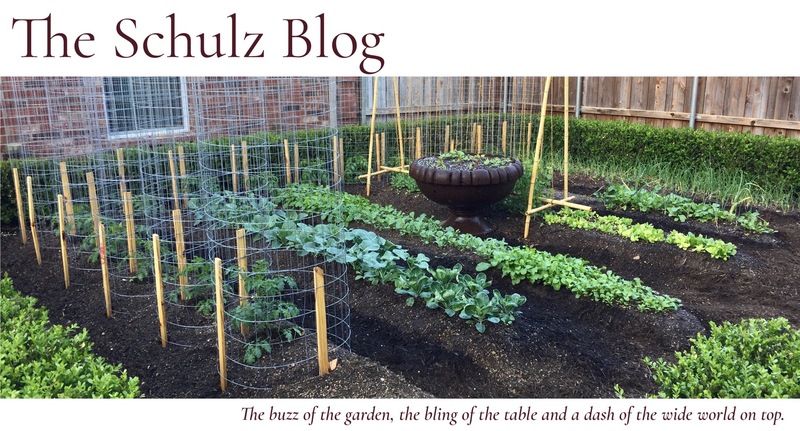 If you’ve been following this blog, you know that I like sustainability through the concept of using and sharing what you have, whether through seeds or starts. We transplanted shoots dug from the clumps of my mother-in-law’s Phlox into our garden last fall. They went dormant in the winter, then re-sprouted this last spring and REALLY started blooming when the heat cranked up…so, you can see, this plant species checks a lot of boxes! I’ve loved this so much that I would have it in every bed, if possible. And, hey, anything’s possible, right? I hope these suggestions might help you feel a little bit better when you look out your window next July. These plantings truly will liberate any struggling, sun-filled summer bed. So don’t be dismayed by your swelter! I say, “Own it!” Well, at least own it in your flower beds. I have no control over the efficiency of your air conditioning or how many times a day you have to shower. I love your suggestions broken out by how much work I want to do!!! Ha! Now, give up some of that Phlox, sister!! You got it! Remind me in late September and we’ll dig you some starts. Sounds like I need to get some Phlox from Nana. Our backyard could use some color. You do. It has been my absolute favorite!!! I also love these seven, but have never grown the Cestrum. I will have to add another all-time favorite–lantana. I need a start of the phlox. Maybe I can propagate a start of that for you!